All-wheel drive and de-icers don't trump a good set of snow tires when you're facing the worst winter weather, but those features don't hurt. NEW YORK (TheStreet) - During a snowy winter, drivers and car buyers can use any advantage they can get. The flakes are already falling in higher elevations, so it's time to start thinking about how to tackle the snow. The folks at the winter driving school at Michigan Technological University's Keweenaw Research Center in Houghton, Mich., say that while they may cost you some acceleration, snow tires provide great traction on curves and grades and should help keep you out of trouble. The brand doesn't matter, the variety doesn't matter: If you put a good set of snow tires on your car, it'll improve your odds once the snow piles up. The folks at the Bridgestone Winter Driving School in Steamboat Springs, Colo., performed an experiment a few years back to show a group of law-enforcement professionals who used his course that Ford Mustangs and Chevrolet Camaros don't need to be packed away in the winter in favor of SUVs. The school put a police SUV, a Ford Crown Victoria cruiser and a high-performance pursuit vehicle on a snow- and ice-strewn track and watched the SUV get smoked and the Crown Victoria lag behind the sportier models in new shoes. While many drivers are put off by the extra $1,000 to $2,000 it costs to buy and maintain an extra set of wheels or tires, it's less costly than splurging for an SUV with four-wheel drive. That drive system may dislodge an SUV from a snow pile more easily that a rear-wheel drive or front-wheel drive vehicle would, but good luck stopping it without snow tires. That said, there are a whole lot of folks out there who believe that all-wheel drive, headlight de-icers and seat warmers make a big difference in winter driving. The precipitation doesn't necessarily have to be snow for those to come in handy, though. According to the Department of Transportation's Federal Highway Administration, wet roads account for roughly 1.13 million crashes each year, 75% of all weather-related crashes and 18% of vehicle crashes overall. That number shrinks only somewhat to 707,000 crashes, or 47% of weather-related crashes and 11% of all crashes, when you narrow wet-pavement incidents to just rain. Even if you make it through the worst rainstorms unscathed, they're more than enough to affect your commute severely. Light rain reduces traffic flow 2% to 13% in light rain, while heavier rain slows things down 6% to 17%. If you live in the Pacific Northwest, where rain is a much an absolute truth as the sun rising and setting, or in Florida or along the Gulf Coast where even storms just passing through can play havoc, everybody else's spring showers are just your standard nightmare. 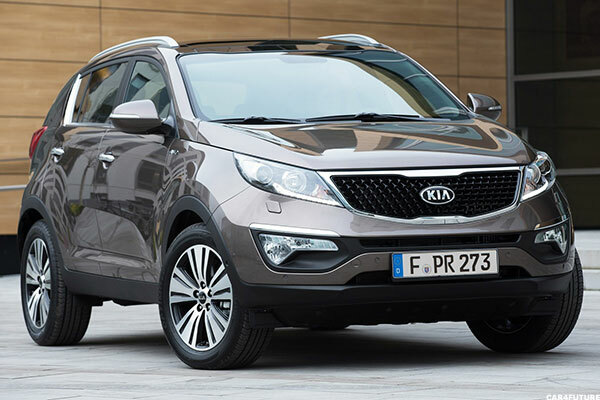 Yep, that's a Kia sporting the fancy all-wheel drive and making that upgrade affordable for small crossover buyers. By throwing in AWD for $1,500, Kia gives the feature one of the lowest add-on prices of any non-standard AWD vehicle on this list. Meanwhile, features including Sirius XM satellite radio and Bluetooth wireless connectivity make lovely freebies, while options including a rearview camera, UVO information and entertainment system and backup warning system can still be had within the $25,000 price range. You kind of hate to see the scant 26 cubic feet of cargo space, but it can work for small families and those trucking a minimum of stuff. Nope, it's not standard AWD either, but a nearly $3,000 upgrade. That said, the CX-5 is way sportier than its compact-crossover competition, with plenty of practical features to justify the expense. Let the driver play with the 155-horsepower engine and available Bluetooth hands-free phone and audio streaming, HD radio, Pandora Internet radio and navigation system. It's the ample rear seating and up to 65.4 cubic feet of cargo space that complement the all-wheel drive nicely as this car's family-friendliest features. Those, and maybe the optional blind-spot warning system or the combined 28 miles per gallon of efficiency. Not surprisingly, the all-wheel drive isn't standard — it's a $2,000 upgrade from the $18,990 base model — but it's a worthwhile pickup for a vehicle with a price that still comes in pretty low on this list without it. Sure, the Juke is small and funny looking, but with a combined 29.5 miles per gallon that's among the best in its class, it's what's inside that counts. That includes a surprising 36 cubic feet of cargo space and a navigation system, rearview camera, leather interior and a beefed-up speaker system available as upgrades. Not bad perks for a car sporting all of four cylinders in its engine while putting out 188 horsepower. 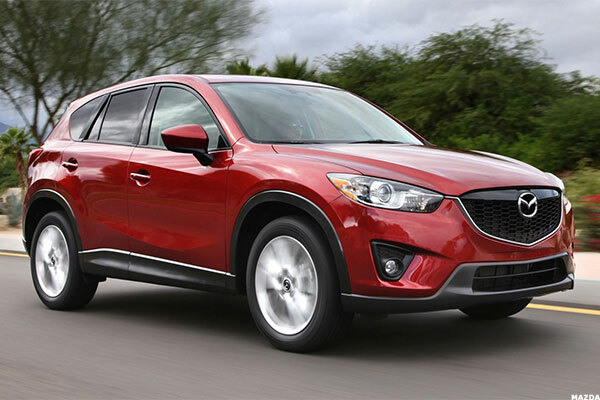 The more costly, but more spacious, Nissan Rogue also made KBB's list. 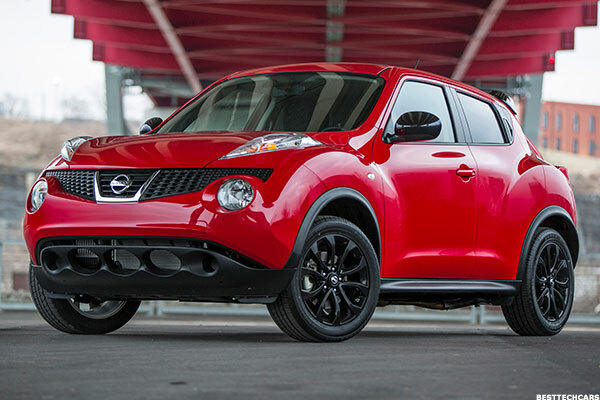 But with such a low starting price, the Juke offers a whole lot more upgrades for the same price. This is the go-to family crossover in the United States and a perennial Top 10 best-seller not only for its price, but what that price affords. The all-wheel drive version is a less-than-$2,000 upgrade, but a welcome addition to this mainstay's wealth of perks. 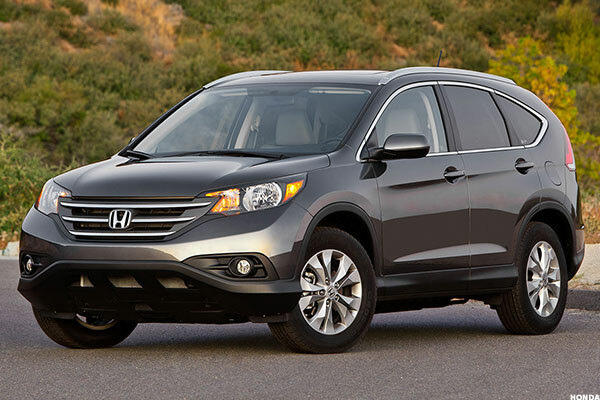 After the popular crossover's 2012 overhaul, Honda only made that the switch to a CR-V easier by adding a leather interior, moonroof, Pandora-connected information display, heated seats and rearview windows and navigation system with controls mounted on the steering wheel. It's also trimmed fuel efficiency to a combined 25 miles per gallon in the AWD version while leaving all 70 cubic feet of cargo space untouched. It gives cash-strapped families a whole lot for their money, which may explain why so many continue to shell out for it. 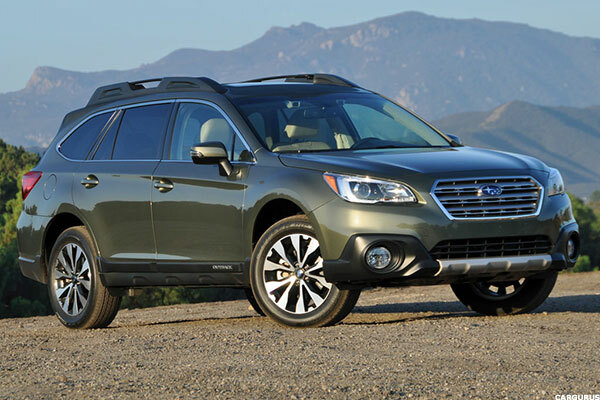 A few months back KBB placed the Forester and four other Subarus in the Top 5 spots of its all-wheel-drive Top 10: The Outback ($24,895), Legacy ($21,695), Impreza ($17,895) and XV Crosstrek ($21,995) all scored high marks with KBB, yet all managed to limbo beneath its $25,000 cutoff. Still, you can't ask for a better investment than the Forester. A 10-year-old Forester still has more than 25% of its original value. The newer models have ever reverted to the boxy wagon look of their predecessors, while retaining the standard all-wheel-drive for well-off parents trying to balance shuttle runs to lacrosse practice with trips to Whole Foods or Trader Joe's. Those combined 28 miles per gallon are a vast improvement over the 2013 model's 24 mpg, and its interior is bigger than both the Honda CR-V and Ford Escape — though its 34 cubic feet of cargo space is on the low end. Subaru's added Bluetooth connectivity to all its models and beefed up the options on its pricier trims, which means rearview cameras, power liftgate, voice-activated GPS and X-Mode engine control that provides additional traction on inclines and wet roads.